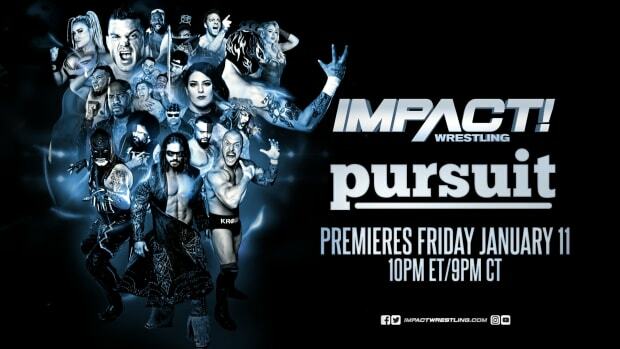 Impact Wrestling Results (6/26/14) - A New Director Of Wrestling Operations, It's True! Impact Wrestling starts off with a video package showing Kenny King vs. Eric Young last week on Impact. It was an all out brawl at the end of the match and MVP didn&apos;t like it. He makes Bobby Lashley vs. Eric Young for the belt at the main event with no one in the building. The match takes place and we see Kenny King interfere but Eric can&apos;t come back from it and Lashley takes the gold. They beat Eric down after the match, but Bobby Roode comes to the aid as he returns to the show. MVP is using crutches in the back with Lashley and King at his side. MVP says it is a big night for them. They are going to party and have champagne. MVP tells Bobby to go in front as he is the champion. Lashley does. They enter the building. The Beautiful People come out on stage. Angelina Love has the championship in hand. Sky is beside her. They let the pigeons loose as they enter the ring. Taryn Terrell and Gail Kim come out next to Taryn&apos;s music. They walk down the ramp and get in the ring together. Gail Kim starts the match. Love is about to start but tags Sky in. Sky enters and goes right after Gail. She takes her down by the hair and then gets her up and whips her in the corner. Sky runs to her but Gail jumps up and goes behind Sky applies an arm drag takedown and then works on the arm. She tags Taryn and they double team Sky. Taryn continues the attack with multiple offensive moves. Sky tries to fight back and gets to her corner and tags Love. Love enters and goes after Taryn with kicks to the gut. Love gets Terrell up but Terrell fights back with punches. Love makes her go in the ropes but Taryn makes Love fall through. Gail grabs Love on the outside and brings her back in the ring. Taryn continues the attack. She goes to climb the corner but Sky distracts her. Love goes after Taryn but Taryn fights her off and does a flying closeline. She covers but Love kicks out. Love rolls to the outside. Taryn follows. Love runs around the ring and gets back in. Taryn follows but Sky trips her as the referee is distracted. Love gets the offensive advantage now as she slams Taryn down to the mat. She tags Sky. Sky and Love drop a double elbow drop. Sky covers but Taryn kicks out. Sky whips her in the corner and then does a smash. She then chokes her with the boot. Sky starts kicking Taryn in the gut multiple times. She lifts her up and slams her down and does a cover. Taryn kicks out. Sky grabs Taryn but Taryn fights back with punches. She runs in the ropes but Sky kicks her in the gut and then chest and then hits a neck breaker. She covers but Taryn kicks out at two. MVP is using his crutches as he goes through the back. Lashley is in front of him while King is beside MVP. They hype Lashley up as the destroyer of the worlds. Mike Tenay announces that Bound for Glory will be held in Tokyo, Japan on October 12th. Dixie Carter is walking backstage and is in a great mood. The camera man asks her about her mood and she says she can confirm that tonight is a great night to be Dixie Carter. Stay tuned. Music hits and here comes MVP and Kenny King. They have two ladies with them. They walk down to the ring and get in. The ring has a long table. MVP gets on the mic and introduces the TNA World Champion Bobby Lashley. Bobby comes out to his music with a lady on his arm. They walk down the ramp as the crowd boos. There are balloons at the corner posts. They get in the ring. MVP states that is official. MVP has regained his power as Director of Wrestling Operations as Lashley won the TNA World Championship. As for King, he has his hands full with ladies. MVP says it didn&apos;t happen as quickly or precisely as they would have liked, but they did hit their goal and they are proud. MVP states it is time for some house cleaning rules as some stepped out of their boundaries. He says Eric Young will be begging for his release and MVP will be happy to give it to him. Just then, music plays and here comes Eric Young. His arm is in a sling from the attack after the match. Eric has a mic in hand. Eric questions the release statement. He actually wants an extension as he isn&apos;t going anywhere. He says he didn&apos;t think things were going this fast. He knows he can&apos;t beat city hall but he isn&apos;t fighting city hall. Eric takes off his sling and runs to the ring. He slides in and Lashley and King attack Eric. MVP uses one of his crutches and pokes EY. Lashley holds EY from the back and King punches him. Lashley goes out of the ring and looks under the ring. As he does, Bobby Roode runs through the crowd and jumps in the ring. MVP goes to hit EY with the crutch but Roode grabs it from behind and MVP falls and rolls out. Roode hits King with it and he rolls out in pain. They meet up with Lashley as the crowd roars. Roode and EY are in the ring. Roode has a mic in hand. EY has a champagne bottle as the table in the ring is flipped over. Roode says he knew EY for 20 years. He says they had their ups and downs, but at the end of the day, they share two common bonds. One is the fact that they walked into this company and signed contracts on the same day. They built TNA from the bottom up. The other bond is the fact that they love the sport of professional wrestling. They eat, sleep, and drink professional wrestling. They have the love, desire, and passion to wrestle. They took that away from Roode 7 weeks ago with a suspension. EY came out every night to fight for the love of professional wrestling. He did it to give order and honor to the company as it had it before MVP walked through the doors. Roode says the games are over. It is time to get this company back. He is not doing it for himself or EY but he is doing it for the wrestling fans all around the world. He is doing it for all of the guys and girls who bust their @ss for the love of professional wrestling. Just then a guy in suit comes out on the stage. MVP asks who he is. He is Earl Solomon Armstrong and he represents the Board of Directors. He says MVP is no longer the Director of Wrestling Operations. The crowd roars. The guy says his replacement will be here soon to fix the company. Roode asks if MVP can fire him or suspend him. He can&apos;t. Roode says he will listen to the fans as they want him to attack MVP. Roode punches MVP right in the face. MVP falls and rolls out of the ring. Knux is on the phone backstage and says he will send the money soon. Knux will get it. Knux tells the other members of The Menagerie and he tells them that his dad didn&apos;t get the money yet and he is threatening to take the family business away. Knux tells Crazzy Steve that he was inches away from the X Division Championship at Slammiversary. Now he will go out and challenge Sanada for the gold. Just then, DJ Z and Jessie Godderz enter the frame and ask why Sanada would accept his challenge while he can accept DJ Z&apos;s. DJ Z can speak Sanada&apos;s language. Knux says he can&apos;t speak Japanese. Just then Manik enters the picture without the mask. He talks to Jessie and DJ Z but they walk away. Manik puts on the mask and turns to Crazzy Steve. Steve tilts his head back and forth. Manik says he has something on his face and walks away. Steve touches his face to see if he can get it off but Knux tells him to not worry about it as he looks better than ever. Dixie Carter is in her dressing room. Rockstar Spud comes up to her and talks about MVP losing his position. Dixie says she knew she had the board&apos;s attention but she nailed it. Spud says that since he isn&apos;t it, then you know who it is... Dixie smiles as she realizes it will be her. She needs a great bottle of champagne for the announcement, not Rockstar Spud even though Spud thought it was a good idea. Dixie tells herself that all of the power will come back to her. Sanada comes out through the stage and gets in the ring. He grabs a mic and asks Manik, Crazzy Steve and DJ Z if they want a title match. They do. So Sanada will give it to them. Rockstar Spud knocks on the the door of Dixie&apos;s room. She opens and he tells her it is time. Spud takes Dixie by the arm and they walk to the stage. Kenny King is furious outside. He turns and looks at MVP as he is sitting on a couch. MVP doesn&apos;t know. He says his lawyers will fix this. He then states this is Dixie&apos;s fault. Dixie thinks she can take his job. Bobby Lashley is standing over him staring. MVP holds his head. Magnus and Bram are backstage. Magnus says people will say that they have never been in a Monster&apos;s Ball match, but that doesn&apos;t mean anything. This match has chairs, tacks, baseball bats, and more. That was their Friday night before they came professional wrestlers. Bram is getting excited! He and Magnus walk away. Dixie and Rockstar Spud come out on the stage and walk down the ramp. Spud opens the ropes for Dixie. They enter the ring and she grabs a mic. She yells, "Woooo!" She says she hopes everyone understands the historic moment that is going down right now. Dixie says she put her faith in people like Bobby Roode and Bully Ray. Roode let her down and Ray stole her money and turned on her. Dixie says everyone put their faith in MVP but he turned his back on everyone and gave access to his friends and made one champion and not him because he broke his knee. Tonight is the night when Dixie Carter takes control of TNA again. This new Dixie... this Dixie Carter 2.0 is going to be great as everyone wants it. We will see a lot more of her now. Dixie introduces the board representative. Here comes Earl Sullivan Armstrong. Spud pours Dixie a class of champagne and then pours himself one. Earl grabs a mic. Dixie welcomes him. Earl thanks her for the kind words. He says there has to be a misunderstanding. He says he would announce the Director of Wrestling Operations. The awkward thing is that it is not Dixie. Spud spits his champagne out of his mouth and then takes his jacket off. Earl states that the person who takes MVP&apos;s spot wants to remain a secret but will be her later tonight. Dixie throws her champagne in the face of the Board Director. He backs up and walks away. Dixie starts yelling as she says this is her ring and no one is going to take this company from her. She owns this company and the only way that someone will take it is by over her dead body. Bully Ray&apos;s music hits and here he comes! Bully walks out and gets in the ring. Spud tries to protect Dixie as he stands in front of her. Ray says he will kick Spud in the face, drink her champagne, and then do the next thing. Dixie asks what he wants. Does he want $50,000? What about $200,000? Spud starts to say something but Ray yells at him to shut up. The crowds wants her to go through a table. Ray asks if he should take the money or put her through the table. The crowd boos for the money and cheers for the table! Ethan Carter III runs out and gets in the ring but Ray punches him in the face and tosses him out of the ring. He then kicks Spud in the face. Just then Dixie walks up to Bully. She goes to hit him but he blocks and lifts her up. Spud enters the ring and turns the table over. Ray brings her down and Ethan helps her get out of the ring. Spud slides out. They all meet on the ramp. Ray was so close. Dixie Carter and Spud are rushing backstage. She wants to get away. Spud asks her about Ethan but she isn&apos;t stopping. Bully Ray is in the back and says he will put Dixie Carter through a table one day. He promised the wrestling world. He was so close tonight but it will happen. James Storm&apos;s music plays. Here comes Storm. He walks down the ramp and gets in the ring. As he does, we see video of him spitting beer in the face of Dallas Cowboys&apos; pliers from Slammiversary. Mr. Anderson&apos;s music hits and he comes on the stage. He reaches up for his mic. He introduces himself and walks down the ramp. James Storm gets out of the ring and meets him half way. Ken punches Storm in the face and he falls. Ken follows him down the ramp and smashes his face in the steel steps. James rolls himself in the ring. Ken covers him but Storm kicks out. Ken tosses him to the outside but Storm lands on the apron. He kicks Ken in the head and then gets in the ring and hits a neck breaker. He covers but Ken kicks out. Storm punches him in the face and whips him in the corner. James runs to him but Ken kicks him in the face and hits a spinng neck breaker. Both stand and James fights back as he nails Ken&apos;s face in the top turnbuckle. Ken fights back with punches, elbows and then picks Storm up and does a rolling senton. Ken slowly covers but Storm kicks out. The camera is outside. A limo is pulling up. It stops. Can that be the new Director of Wrestling Operations? Samuel Shaw is walking in his solitary confinement room. Gunner walks up to him and says he talked to Shaw&apos;s doctors and they are allowing Shaw to leave, but under Gunner&apos;s protection. He asks how that sounds. Shaw says, "Okay." Shaw shakes Gunner&apos;s hand. James Storm is waiting backstage. Sanada walks up to him and Storm shakes his hand and says he is the protege of The Great Muta. He talks about cashing in the X Division Championship for the TNA World Championship. What happens if he loses... if he chokes? Sanada moves in on Storm but Storm laughs and says he knows more about Sanada than he thinks. Storm tells him not to choke. Ethan Carter III is on the phone with Rockstar Spud and he tells him to come back and get him. Just then, Tommy Dreamer attacks Ethan. He smashes him in the steel garage doors and then takes him to a table in the back. Ethan fights back and rams Tommy&apos;s face in a guard rail. Tommy fights back and throws a trashcan and a chair at Ethan. He tosses him through a curtain and Ethan comes on the stage. Tommy kicks him in the gut and then grabs a trashcan. He smashes it to Ethan and then finds a bottle. He drinks it and then smashes it to Ethan&apos;s face. Ethan rolls down the ramp. Ethan grabs a shirt or a piece of cloth and chokes Ethan with it. Ethan fights it off and then does a body slam to Tommy on the ramp. Ethan pulls the ring mats back and goes for a slam, but Tommy does a back body drop to Ethan on the ring mats. Both stand and Ethan whips Tommy into the steel steps. Ethan grabs Tommy and punches him in the face. He goes to whip him but Tommy reverses it and Ethan goes knee first into the steps. Tommy grabs a chair from the fans and hits Ethan in the ut with it. Tommy grabs him and takes him to the steel ring post but Ethan blocks and rams Dreamer&apos;s face into the steel post. Tommy rolls in the ring. Ethan gets in the ring and goes to Dreamer in the corner. He whips him in the corner but Tommy bounce sour and closelines Ethan. He punches him in the face and then bites him. Ethan turns it around but referees and officials come out and separate them. Tommy comes forward and goes after Ethan but they pull him away and Tommy rolls out of the ring. Abyss and Willow are backstage. Abyss says Abyss and Bram will fear the pain from them. Willow asks if they have everything. Abyss has the thumbtacks in hand. Willow asks about Janice and Abyss states he always has her nearby. MVP, King, and Lashley are backstage. MVP says he heard there is a limo outside holding the new Director. He wants to introduce himself. MVP, King, and Lashley walk up to the limo. They check the limo. They open the driver door and Lashley takes the limo driver out by his shirt. MVP says he can&apos;t do that. MVP asks the driver where his guest is. The guy can&apos;t say. MVP allows Lashley and Lashley attacks the driver and tosses him over the car. They walk away. Bram and Magnus walk down the ramp and get in the ring. Abyss and Willow come out next and they walk down the ramp. Bram and Magnus meet up with them on the ramp and they fight. Bram and Abyss fight while Willow and Magnus brawl. Bram and Abyss go in the ring and they fight. Abyss whips Bram in the ropes and hits him. He then tosses Bram over the ropes. Abyss exits. Magnus and Willow enter the ring. Willow does a double leg drop to the gut and then whips Magnus in the corner and does a summersault smash. Abyss sets up a barbwire plank on the guard rail to the ring apron. He goes to send Bram through it but Bram blocks. Willow exits and they throw weapons in the ring from chairs to kendo sticks to trashcans and lids. Abyss and Willow enter but Bram and Magnus attack them. They hit them with weapons. They are now in control. Magnus goes after Willow but Willow fights back. He hits Whispher in the Wind and then goes after Bram. He smashes a trashcan into Bram&apos;s face and then kicks it in his face. Magnus is lying on the mat. Willow climbs the corner and hits the Swanton Bomb but Magnus moves out of the way. Magnus grabs the chair and hits Willow in the back and then slides it to hit Abyss in the gut as he is standing on the outside. Bram enters and he is bleeding. Abyss looks under the ring and finds Janice. He swings it and it gets stuck in the turnbuckle as Bram ducks. He can&apos;t get it unstuck. Bram and Magnus attack Abyss now. They take him out of the ring and they hit him with a trashcan lid on the head. Magnus grabs a chair and brings it in the ring. He attacks Willow with it in the back. Bram grabs handcuffs and cuffs Abyss to the guard rail. Bram enters and grabs the chair and smashes it to the back of Willow. All four are hurting in serious pain. Magnus slowly crawls to Bram and tries to celebrate. The camera shows black suit pants and black dress shoes. The person is walking backstage. Is that the new Director of Wrestling Operations? We will find out. Earl Sullivan Armstrong comes out on the stage. He introduces the new Director of Wrestling Operations and it is... Kurt Angle! Kurt comes out as his music plays. The crowd roars. Kurt walks down the ramp and interacts with the fans around the ring. He gets in the ring with a mic in hand. He says, "Guess who is in charge?" He says it is about time this company has got their heads out of their @sses. He said the company made many mistakes in the past from Dixie Carter to MVP. He says he has no motives. He accomplished everything. He says he is doing this for the people in the back. For anyone who wants to challenge him, it is about to become real... DAMN REAL! Music plays and here comes Bobby Lashley, MVP, and Keny King. King holds the mic as MVP talks. MVP asks if they really replaced Kurt with him. Kurt says he is MVP&apos;s boss!!! MVP says he isn&apos;t his boss. He wants to talk to him face to face. Kurt knows about knee injuries so he knows how hard it is to move around. MVP gets in the ring with Lashley and King. MVP says he knew he had to watch for Dixie, but now Kurt? Is Kurt mad that he threw him out last week? MVP asks if Kurt is in terms with his demons in his life. He says Kurt has three demons in front of him right now. Does he think he will tell King or Lashley what to do? MVP won&apos;t listen to him. Kurt may have authority but they have power. They can use that power to end Kurt&apos;s reign right now. Kurt asks if this is what they want. If they lay a hand on him he will fire all THREE of them right now. Kurt says Bobby Lashley will put the belt on the line next week against Eric Young, the guy who he screwed. Eric comes on the stage. MVP asks if that is what he is going to do. Kurt says he isn&apos;t finished. He reinstates... Bobby Roode! Bobby comes out and meets with Eric on the stage. Eric takes off his sling and they both run down the ramp and get in the ring. Bobby goes after EY while King fights Roode. It is a back and forth battle while MVP gets out of the ring and Kurt stands there watching. The show fades.